The eastern alternative. – Dirty wet dog , boats and sailing. I think it’s time for me to get on with some sailing again. Last week, as i write, i got an absolute spanking in Lyme bay when i attempted a short coastal passage from the Exe estuary to Salcombe and then home in what should have been a steady force 4 to 5 easterly. Instead what i got was a force 7 and more with heavy , steep breaking waves, snow and surfing conditions when i ran for shelter. I left WABI” tucked away in the corner of Torquay harbour and by the time i had slogged round the waterfront to the train i was thoroughly cold and fed-up. My spring plan was to get WABI”’ ready for the trip back to the Tamar and sail the route in just 2 legs and that should have been a straightforward downwind trip all the way. My plan then was to start a thorough spring refit nearer to home. The Liberty has been in continuous commission since i bought her and to be honest she is looking more that a little tired and grubby now. When i crawled into the coffin berth last week to do the wiring for the autohelm there was quite a bit of black mildew down-aft and also in the large cockpit locker. What she really needs is to be emptied out completely, washed right out for a starter and then to get a thorough tidy. I could really do with getting the rigs out as well and polish the hull GRP which is all a bit chalky. In fact i have got a page full of jobs, some of which are essential. 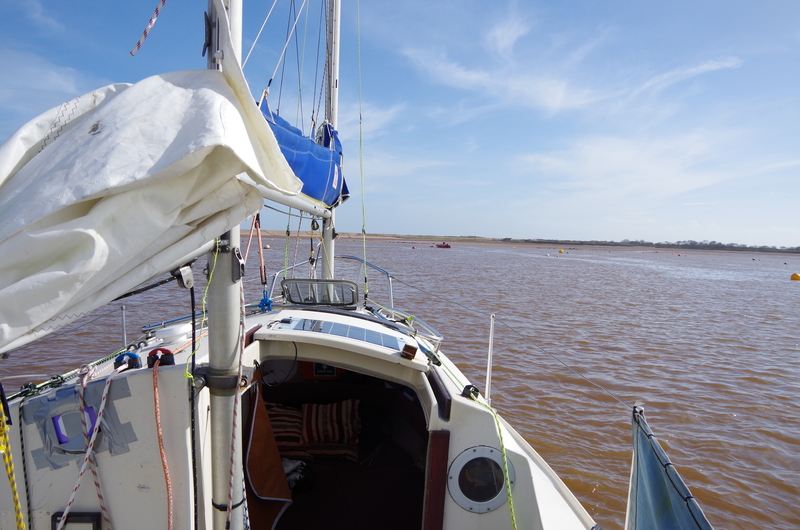 The complete plan for this boat though was always a round-UK voyage visiting all the small harbours , creeks and rivers that i have never been to in bigger , deeper draughted boats. The initial idea was to do whatever work i needed to ‘on the run’ and so far that has mainly worked out fine. Even during my time this winter in Topsham i was still able to get a decent amount done. It isn’t so much that i need to be near base to do a thorough clean-out for example, just that i could do with being somewhere that i can do the jobs and ideally ashore. I did think about doing it at Topsham with a haul-out before Mark (trouts) got busy but during the winter we never had a dry and mild spell with enough time for me to get the work done. The boat is ready to sail, at least in ‘normal’ conditions and there isn’t really any reason why i shouldn’t continue the eastward voyage and maybe plan for a lift-out in either Poole or further east in Chichester maybe. Chichester harbour was always my planned end-point for this year perhaps in a mud berth somewhere such as Hayling or Thornham. Cruising around Poole would be nice for a week or so, some of the Solent harbours and creeks are a lot nicer than the mobo-infested marina-ports and a lot of Chichester is great for a small boat like mine. The fly in the ointment is of course the passage across Lyme bay and getting around Portland Bill at the eastern end. From Torquay or Dartmouth it’s about 45 miles to the Bill of Portland and it really has to be passed within a very narrow tidal slot to take the inshore passage. That needs doing in daylight and ideally not on a big tide, those 2 factors then determine when to leave port in terms of choosing an ideal tide and arrival time at the Bill. If i sail very well at full cruising speed it will take me about 10 hours to get across Lyme bay and even with an early start i would still need slack water at the Bill in late afternoon to be in daylight. The tide-race problem of the Bill is well known, i have taken the inshore passage coming west several times and been within 50 feet of the rocks to not be in breaking waves…..and that close in had to deal with ‘buried’ lobster pot markers (big knife applied). The alternative is to go well offshore and then loop around the Shambles bank to get into Weymouth. All in all that’s probably a 60 mile trip which is feasible in a long day-sail arriving in Weymouth hopefully early evening. I don’t particularly like Weymouth harbour and it’s a sod of a place to get back from but at least i could leave the boat there for a few days. Ideally for the offshore passage i would need a nice westerly breeze and to be able to play the tides as there is a strong tidal eddy in Lyme bay. Having a big spring flood under me would certainly shoot me up-channel for a few hours but i would really want to be out of the tide during the ebb. That might work out as a series of downwind tacks : into the bay to use a back eddy and offshore to get on the east going flood…..then hit a waypoint well south of the Portland race, pass the Shambles bank and head up to Weymouth. One of the peculiarities of the tidal eddies is often a powerful inshore running eddy if i can catch it right. It’s a nice navigational exercise either to plan for an exact time at the Bill and go ‘tight’ inshore or play the numbers and do it like an offshore race. This week for eaxmple i should have a moderate westerly breeze (should have !!) and i do have a potential time slot of getting to the boat from wednesday night through to thursday mid-day and then having to get home some time on sunday for work the next day. That essentially gives me a sailing slot from mid-thursday , all friday and saturday and leave the boat on sunday. So that you guys don’t have to do the tidal work-up the critical time to round the Bill inshore is based on HW Dover and being at the bill 4 to 4 and a half hours after HW Dover. The tidal streams charts i use in the PBO small craft almanac are based of HW Devonport so i have also recorded those times and marked up the tidal streams charts for Portland so that i can see an hour-by-hour picture of the flow. Those times this week would give me 19.10 at the Bill friday and 20.09 on Saturday…..both are late in terms of daylight and the tides are only just coming off springs so maybe the offshore passage would be the better choice. What i could then work on is simply leaving harbour as early as i can friday and just making tidal stream predictions to plan the passage. Plan 2 then, an offshore passage based on clearing Torquay harbour at around 0530-06 and simply starting to sail down the track towards a waypoint well clear of the Bill. For this one i consult the tidal streams pages for the English channel and they are based on times of HW Dover so for your reference they are HW Dover friday 23.03.18 @ 0216 and 1440. It looks fine at first but an 0600 start would run me straight into the tidal gate off the Bill and that will be running up to 2 and small-change knots against at my projected arrival there. The other alternative is to leave 6 hours earlier ie at midnight and do a night passage, the tides then work out much better to either pass the Bill well offshore or even keep going east, bypass Weymouth completely and head into Poole harbour after another 6 hours or so. Next Really for sale now. Steve, great to see you continuing with the voyage east. I visited Poole Harbour once, (about 8 years ago) — the marina (its name rhymes with “flee”) was really expensive (no surprise there eh) and the showers across the road were cold. Still, your 12 hour “midnight express” plan to said harbour sounds good to me.